I developed this ‘ultimate banana cake’ recipe for my Husband, Chris, who really loves banana cake. He challenged me to create the most banana-ry treat to go with his afternoon cuppa. This is not one for the casual banana consumer! 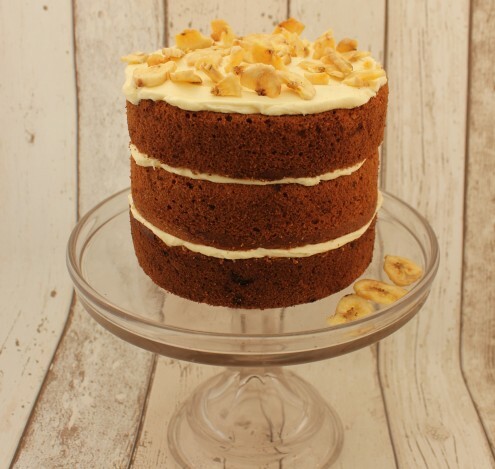 The inclusion of that wonderfully synthetic banana flavour that comes from the milkshake powder in the banana frosting is what makes this cake so fabulous. Cream the butter and sugar until pale, creamy, and fluffy. Allow 5 minutes for this job in a freestanding mixer or a few minutes more using a hand whisk. Add a teaspoon of good quality vanilla extract. In a separate bowl, combine your flour and raising agents with a pinch of salt and a pinch of ground cinnamon, and set aside. Beat your eggs, one at a time, into the creamed butter and sugar. Ensure that each egg is fully incorporated before adding the next one. If you notice any splitting or curdling of your mixture, throw in a spoonful of your dry ingredients. Carefully fold half of your dry ingredients into the cake mix. Add yoghurt and mix until combined. Fold in the second half of your dry ingredients. Finally, stir through the mashed bananas until evenly distributed. Divide your cake mixture between two lined 8″ sandwich tins and bake for 30 minutes, or until risen and springy to the touch. When in doubt, a cocktail stick inserted into the middle of your cakes should come out clean. Cool these cakes in their tins for 10 minutes before turning out onto a wire rack to cool completely. To make the banana frosting, begin by beating the butter until it is creamy and soft. Add half of your icing sugar and beat until combined. Add your cream cheese and beat until combined. Add the banana milkshake powder and enough icing sugar to make a buttercream that is soft and spreadable but not runny, the consistency of thick whipped cream. It is hard to be specific about the exact amount of icing sugar that you will need as this is affected by ambient temperature. Beat for a further few minutes until light and deliciously fluffy. This extra time results in a really light buttercream that melts in the mouth. Sandwich your two banana cakes together with a thin layer of banana buttercream in the middle. You will have sufficient buttercream to cover the top and sides of this cake too, if you wish. I have broken a handful of dried banana chips on top to decorate.